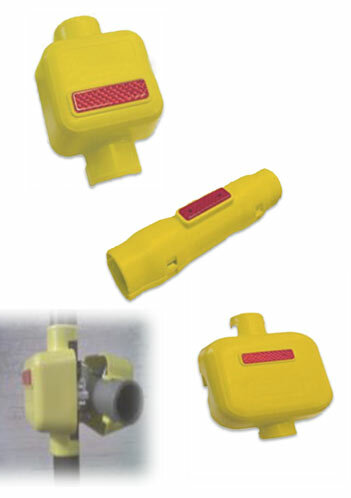 The Hi-Viz Scaffold fitting cover clips around the tube to shield fitting bolts that can injure anyone who passes near the scaffold. To protect both sides simply use two covers back to back. Single and double joint covers available. Cable ties can be used to prevent removal. Fitted with a reflector for night visibility. The Hi-Viz System Tube Sleeve clamps around scaffold tube to give a hi-viz element to aid visibility and in turn prevent accidents. Cable ties can be used to prevent removal. Fitted with a reflector for night visibility (one side red/one side white). The Hi-Viz System Scaffold Joint Cover clamps around the tube to cover up exposed joints on Cuplok, Ringlock & Kwikstage to prevent injury or tampering.